Local historian and archivist – Terry Fagan – seeking home for collection of local artefacts and memorabilia. Our Terry Fagan – local historian and archivist – featured in an Irish Times article detailing his vast catalogue of historical memorabilia. Follow the link to the Irish Times site to read the full article. 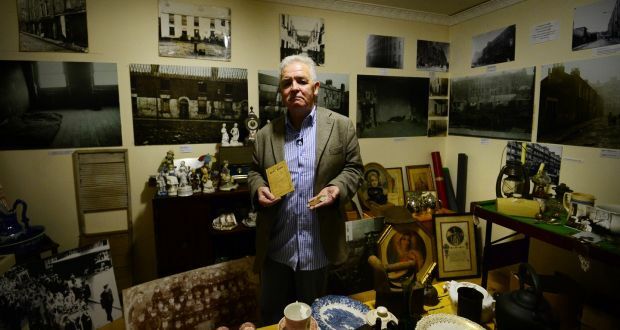 Terry Fagan of the North Inner City Folklore Project with some of the items stored in a boarded up flat in Sean McDermott Street. Photograph: Bryan O’Brien. Behind the ugly, graffiti-festooned steel door to an abandoned flat in St Mary’s Mansions on Dublin’s Seán McDermott Street, there is an Aladdin’s Cave of artefacts and memorabilia. The items that have been saved from tenement homes and from skips, or been donated by residents, and the stories they have told local folklorist Terry Fagan, amounts to a unique social history archive that is crying out for a proper home in the area. “It needs to stay here,” says Fagan, a 66-year-old north inner city Dub, born in the long since demolished Corporation Buildings on the street of the same name, and now a resident of Buckingham Street. Author HOPE Hands On Peer EducationPosted on October 10, 2016 February 13, 2017 Categories Community Folklore, Dublin's North Inner CityTags 2016, Artefacts, Community Folklore, Community Heritatge, Corporation Buildings, Corporation Street, Dublin, Heritage Centre, Irish Republican Army, Irish Times, Memorabilia, North Inner City, North Inner City Folklore Project, Photographs, Tenement, Terry Fagan, War of IndependenceLeave a comment on Local historian and archivist – Terry Fagan – seeking home for collection of local artefacts and memorabilia.